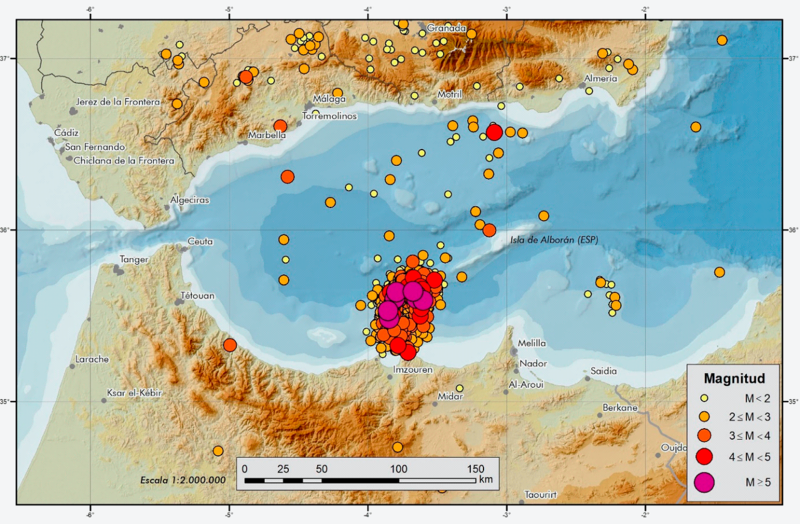 This article describes the tectonic structures and the seismic processes affecting the Iberian Peninsula, listing the main earthquakes that have occurred along the last 500 years and giving thus context to the recently occurred earthquakes in the Alborán Sea, that have affected the Spanish city of Melilla. The Iberian Peninsula is located in a convergence zone between the African and Eurasian plates. This convergence, with movement rates of between 2 and 5 mm/year in the NW-SE to WNW-ESE directions, conditions the general seism tectonics of the zone. The Azores-Gibraltar fracture zone represents the westernmost limit between these two large plates, present since approximately the Lower Miocene Age (24 my). In this contact zone, the seismicity defines four different geodynamic sectors from the Azores triple junction to the Iberian Peninsula (figure 1). Figure 1. Principal tectonic characteristics of the Eurasia-Africa border. In the first, and oceanic or extensional divergence zone (1) is located close to the Azores on the Terceira Rift. The second is an intraoceanic transformational zone (2) (Gloria transform fault), which runs from the southern end of the Terceira Rift to approximately 10°W longitude. The third is located further to the east (Gorringe Bank). One has an oceanic convergence zone (3) which contains tectonic structures with a certain degree of heterogeneity in their orientations and with a tear type stress regime (4). Lastly, there is a continental convergence zone located near the contact between the southern Iberian edge and the African continent (Gibraltar-Northern Algeria), along with an E-W spread zone in the Alborán Sea, which involves some type of subduction or lithospheric delamination (5) process that is not yet well understood (Buforn and Udías 2010). The continental contact zone presents a higher degree of complexity for this reason. An important part of the convergence between Eurasia, Iberia, and Africa is consumed in the interior of the peninsula, resulting in seismicity that is distributed diffusely within a relatively extensive band, around the supposed contact, and in which earthquakes occur at significant distances from the edges of the plates. This means that the seismicity presents very different characteristics throughout the entire region, demonstrating the aforementioned seismotectonic complexity. These differences are manifested in the depth, magnitude, seismicity rates, and in the focal mechanisms of the corresponding earthquakes. The large earthquakes occur in the areas of the Gulf of Cádiz - SW of the Cape of Saint Vincent, and NW of Algeria, with smaller-magnitude earthquakes occurring in the zones of the S of the Iberian Peninsula and N of Morocco (figure 2). The vast majority have superficial epicentres (h minor than 50 km), but a significant number of earthquakes are also generated at intermediate depths (50-200 km), mainly in the areas of the Gulf of Cádiz, Gorringe Bank, High Atlas, and the Granada-Málaga-West of Alborán zone. In general terms, the focal mechanism of superficial earthquakes shows inverse faults (6) in the zone of the Gulf of Cádiz and in the zone of Northern Algeria, tear faults in the north of Morocco and normal faults (7) in the South of Spain and Alborán Sea. Figure 2. 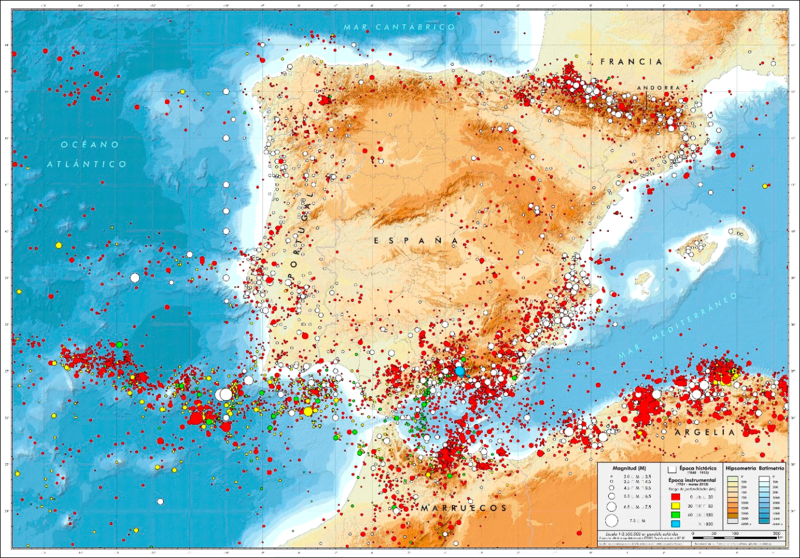 Seismicity of the Iberian Peninsula and nearby zones with magnitudes 3.0. or higher. This section provides a brief description of the earthquakes that we consider to be most important of the large earthquakes that have occurred in the peninsula, either due to the circumstances that accompanied the event, some of which are quite unusual, or because the earthquakes affected a large area. Martínez Solares and Mezcua (2002) includes a complete bibliography for each one of them. This earthquake had an intensity of between VIII and IX, causing 150 deaths in Vera and another 15 in Mojácar. The damage was quite severe and some structures were even destroyed, leaving the city of Vera, with buildings that were highly vulnerable, reduced to rubble. This circumstance made it necessary to consider moving it to a more suitable location. Due to its medieval and Muslim history, the city was located on a hill and plans were made to move it to a flat location. It is very likely that positioning on a hill may accentuate damage due to the effect of topography, generated due to the concentration of seismic energy. By order of Emperor Charles I, in 1519 a report was prepared on how the city should be rebuilt, although the principal justification was based on strategic motives due to the insecurity and weak defence against a possible attack from North Africa. According to Villanueva Muñoz (1986), the new city was to have a regular layout, straight streets with perpendicular intersections, arranged around a main street, as series of secondary streets, and surrounded by a defensive perimeter, although all aspects were conditioned by the military and defence criteria mentioned before. From the point of view of insurance, a document from the time of the earthquake found in the Vera Municipal Archive indicates an interesting condition for executing the works (López Marinas, 1977): "If, due to weather, earthquakes, storms with abundant rain, or the forces of the Moors, any part of the works is demolished, or due to the halting of payments, this will be at the expense of the king and the city, and not at the expense of the master and they shall be lost by them and not by the master in question”. This earthquake, with its epicentre located near Alhaurín el Grande, severely affected the city of Málaga, where the population was forced to take refuge on the beach. It was felt as far away as Madrid and Valladolid. In Málaga, it destroyed 852 homes (19.8%), leaving 1,259 (29.3%) uninhabitable, 2,035 significantly damaged (47.4%) and just 3.5% intact (150 homes). In Alhaurín el Grande, 122 homes, or 51% of the total, were demolished. There were 70 dead and 250 injured, and the effects on nature were significant, including cracks in the ground and variations in the flow of springs (Goded, 2006). A rough approximation can be made based on some contemporary documents written the month following the earthquake. In regard to the city of Montesa, these indicate that it was founded on a hill where a castle had been built, in addition to a church and convent, and they indicate poor soil quality. In regard to the church, the document also makes reference to the deficient construction at the time, describing “the disproportionate elevation of the principal walls, with a heavy dome, and lacking the corresponding abutments...caused the earthquake to demolish it more easily, which most likely would not have happened if it had had good ones”. This earthquake was one of the most extraordinary to take place in recent times in Europe, as well as worldwide. As a result of the catastrophe, the king of Spain in 1755, Ferdinand VI of Bourbon, ordered a survey of the most important towns in the kingdom to determine the effects and damages suffered in the disaster, with 1,273 towns responding, resulting in an exceptionally valuable document for determining what occurred. This large earthquake with an estimated magnitude of 8.5 occurred on 1 November 1755, All Saints’ Day, and coincided with the time of mass in Spain and Portugal, causing an enormous impact at the time, because it was felt throughout the Iberian Peninsula and Northwest Africa, as well as in other places in western Europe, such as southern France, northern Italy, and it was also felt slightly in places as far away as Hamburg. The total area affected by the seismic movement was estimated to be approximately 9 million square kilometres. Likewise as this was a large-magnitude earthquake, there were a large number of aftershocks that extended for at least a year. Since the greatest damage occurred in the city of Lisbon, due especially to the fire that was started, this large earthquake has come be called the Lisbon Earthquake, despite the fact that its epicentre was located in the Atlantic Ocean to the SW of the Cape of Saint Vincent, several hundred kilometres away from the city. The total number of casualties has been greatly exaggerated; estimates of contemporary authors indicate up to 70,000 people, but the number of dead due to all causes in all likelihood did not exceed 12,000. In Spain, the actual number of dead is also confusing, although it does appear that the tsunami caused many more fatalities than the quake itself. Sixty-one victims caused directly by the movement of the ground, while the tsunami resulted in 1,214, which was very likely much higher due to the fact that the bodies of many victims were not recovered. Logically, the greatest damage occurred in the cities closest to the epicentre. A contemporary document from Seville provides the following statistics: 25% homes completely destroyed, 25% with significant damage, 25% with minor damage, and 25% with chipping only. The city of Huelva also suffered significant damage: 49% of the homes were damaged, 29% were uninhabitable, and 22% collapsed (Martínez Solares, 2001). The large sea movement was apparently perceptible throughout the Atlantic Ocean, from east to west. At the Cape of Saint Vincent, the land closest to the epicentre, the maximum wave height reached 15 metres, according to some documents, although this value appears to be somewhat exaggerated. In regard to the time that it took to reach the coast of Spain after the earthquake, observations vary widely, from the 30 minutes that it took to reach Lepe (Huelva) to two and a quarter hours to Corcubión (La Coruña). There are also references that indicate that it was felt in the Azores, Madeira, and the Canary Islands, and even in Brazil and the islands of Antigua, Barbuda, and Martinique. The earthquake also caused numerous effects on nature, such as cracks in the ground, landslides, or liquefaction (8). Changes were also noted in the water level in wells, and the increase and/or decrease of flow in springs. Figure 3. Isoseismal map of the Lisbon earthquake in mainland Spain (scale EMS-98). 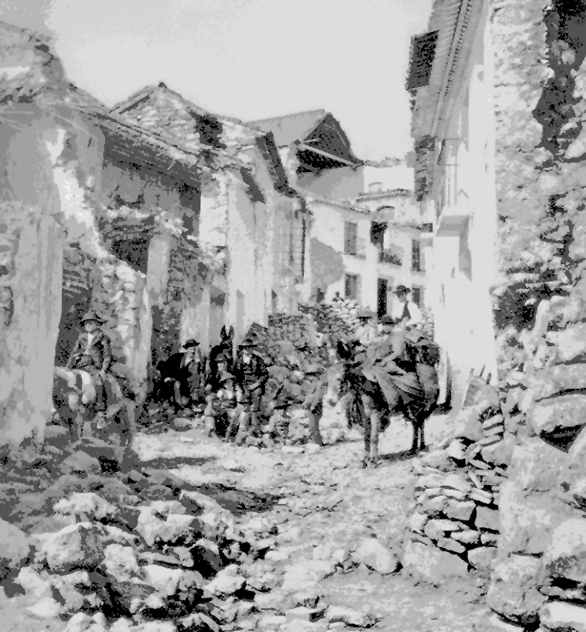 The seismic period of 1806 began in the county of Vega de Granada on 27 October, with a strong earthquake that caused havoc in several towns in the area, specifically in Santa Fe and Pinos Puente; of the 1,322 homes, 94 were ruined, 1,110 damaged, and only 118 were undamaged. The earthquake resulted in 13 dead and there were numerous aftershocks that ended in December of the following year. As a result of this earthquake, and as had occurred other times, there was a significant amount of discussion among the intellectuals of the time as to the origin of earthquakes and how to defend against them. A document from the time (Sempere, 1807) recounts the controversy over the advisability of opening the so-called Ayron Well, located in the city, which had been constructed in Muslim times as a way to prevent earthquakes by allowing underground air to escape. After many technical discussions, the City Council rejected the project and the well was not opened. Also, given the available scientific knowledge at the time, other ideas were defended in passing, such as “earthquake rods” similar to lightning rods, which consisted of long pointed steel rods driven into the ground, whose purpose, given that earthquakes were electrical in origin (a theory popular at the time), was to stop them. In any case, more technical reports were also prepared, such as the one titled On the method of constructing houses in areas susceptible to earthquakes, included in Sempere’s work on earthquakes in Granada. In it, the damage is attributed to the “marshy, weak, and uneven” ground on which the city of Santa Fe was built and also the poor construction of the houses “with earth walls without brick reinforcement or well-interlocked wood in the floors and roofs”. With a maximum intensity of IX-X (EMS) and a moment magnitude estimated at 6.6 Mw (9), this earthquake completely destroyed, the towns of Torrevieja, Almoradí, Rojales, Guardamar de Segura and Benejuzar, among others, causing 389 fatalities. It produced liquefaction, ground cracks, and the flow of springs was also altered. A technical report prepared later by the engineer Larramendi (1829) concluded that cities needed to be destroyed and rebuilt again. For the new layout, Larramendi recommended that it be constructed with a regular and spacious arrangement, with streets at least 40 feet (12 metres) wide and main streets at least 50 feet (15 metres) wide. As an example, he indicated that although the earthquake was stronger in Torrevieja than in Almoradí, there were proportionally fewer fatalities in the former because its streets were wide and buildings low, the opposite of the latter, where streets were narrow and buildings tall. On the other hand, when analysing the reconstruction of Torrevieja, the effect of the soil was mentioned, with some considering it necessary to move the city to a new location just over half a league (approximately 3 km) away, because the buildings had not collapsed there. In the end, the decision was made to rebuild the city in the same place for economic reasons. In regard to homes, the report indicates that they should have a single story, between 12 and 15 feet (3.5-4.5 metres) high. As a safety element, he also added that homes should include a corral to allow people to take shelter there or go into the street when an earthquake was felt. He recommended stonework construction and that a large amount of well-interlocked “woodwork” be used. In this point, engineer Larramendi noted the “modern” concept of simplicity as a general rule in building construction. This earthquake is known as the Andalusia Earthquake and is considered to be the last large earthquake that occurred in Spain. A total of 839 deaths were recorded between the provinces of Granada and Málaga and the cost of the damages was estimated at 5,826,028.66 pesetas of the time (Muñoz and Udías, 1980). A total of 4,400 buildings were destroyed in the two provinces, with varying degrees of damage to 13,000 more. Some of the associated phenomena that were observed included landslides, ground cracks, liquefaction, and alteration in the flow of springs. The Governing Commissioner appointed for this purpose by King Alfonso XII was directly responsible for the reconstruction of the towns in which more than forty homes had been destroyed. Logically, these towns were the ones located closest to the epicentre: Arenas del Rey, Albuñuelas, Alhama, Güevejar, Periana, and Zafarraya. For the selection of the site of the new houses, the causes that contributed to the damage were taken into account, such as instability of the ground, maximum slopes of five percent, and especially that they had not been seriously affected by the earthquake. Churches, schools, and government buildings were built in new locations due to their larger size. In regard to the height of the new buildings, they were limited to two floors, and a minimum width of ten metres was established for streets. The construction characteristics were designed as a result of the deficiencies detected as the causes of the damage, so the new houses were constructed with good foundations, because it was found that virtually none of the homes had them, and the foundation depth was greater than the apparent height of the building (figure 3). Materials were also selected properly and there was strict control over the execution of the construction. The floor space was between 40 and 150 square metres and they cost between 1,500 and 5,100 pesetas of the time. These new homes (figure 4) were not delivered by the Governing Commissioner until two and a half years after the earthquake. Figure 5. 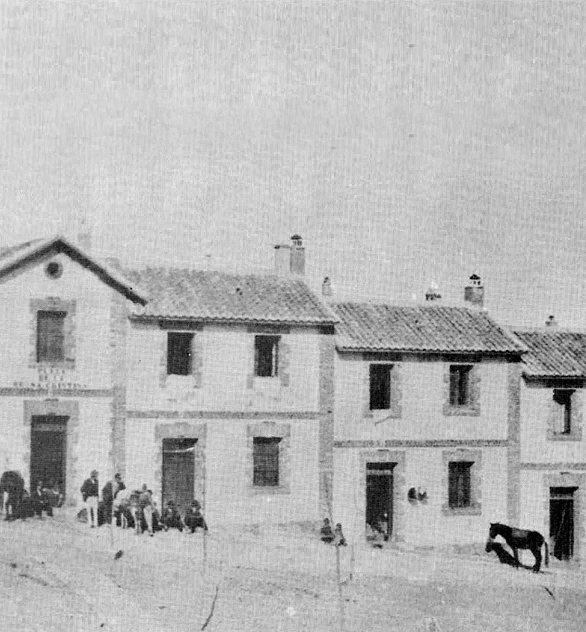 Photo of Alhama de Granada after reconstruction. The notable characteristic of this large earthquake with a magnitude of 7.0 is not how much damage it caused, but how little: it caused no harmful effects, with the exception of the fright felt by some of the people. Its depth of 650 km, the maximum limit of the possible occurrence of earthquakes due to the elastic properties of the earth’s mantle, greatly attenuated the amplitude of the movement of the ground on the surface, limiting it to a relatively minor perception for people. From the seismotectonic point of view, this earthquake at such a great depth posed many doubts in the interpretation with regard to the tectonic configuration of the south of the peninsula, and there are different theories as to its causes in existing seismological literature. This earthquake, with a magnitude of 5.0, was also not very significant, except for the effects that it generated. Due to the poor quality of the buildings, in Albolote, of a total of 900 houses, 7 were destroyed, 50 were left in ruins, and another 300 were uninhabitable and 350 were left with cracks (figure 5). In Atarfe, of a total of 1,500 houses, 10 were destroyed, 200 left in ruins, 600 with serious damage, and 600 with minor damage. There were 11 fatalities, four of which were caused by a landslide (Vidal, 1986). Figure 6. Damage to a building in Albolote (Granada). This was the last large earthquake (magnitude 7.3) that was felt widely in the Iberian Peninsula and Morocco. Its epicentre was located to the SW of the Cape of Saint Vincent, generating a slight tsunami that was recorded by tide gauges, but not by the population. The maximum intensity felt was VII, with some damage recorded in the province of Huelva. There were 19 fatalities, with four of those in Spain caused by panic. The 2011 seismic series in Lorca, apart from the large number of aftershocks, can be characterised as the occurrence of three larger-magnitude earthquakes, a foreshock of 4.5 Mw felt in Lorca with an intensity of VI (EMS98), generated significant alarm among the population, which was surprised soon after by a larger magnitude earthquake, 5.1 Mw, with an intensity of VII and nine fatalities, followed by an aftershock with a magnitude of 3.9 Mw, which occurred four hours after the main earthquake. The epicentre’s proximity to the city of Lorca and the shallow depth of the seismic source (4 km) were responsible for the large amount of damage done to the city. The Alborán Sea is bordered on the north and south by the Betica and Rif ranges, which are alpine in origin. This is a complex contact zone between the Euro-Asian and African plates. Their genesis and evolution are related by the process of convergence between the plates due to the movement of the African plate northward. This process results in a westward displacement of the Alborán block (a small microplate that separated from the large African plate), the formation of the aforementioned alpine mountain ranges, and a lithospheric thinning of the continental crust, with associated volcanism present on Alborán Island. Since 1990, the southern zone of the Alborán Sea has experienced several important episodes of seismic activity. The first occurred in 1994, when a series of earthquakes occurred in an area located just south of the present 2016 series. 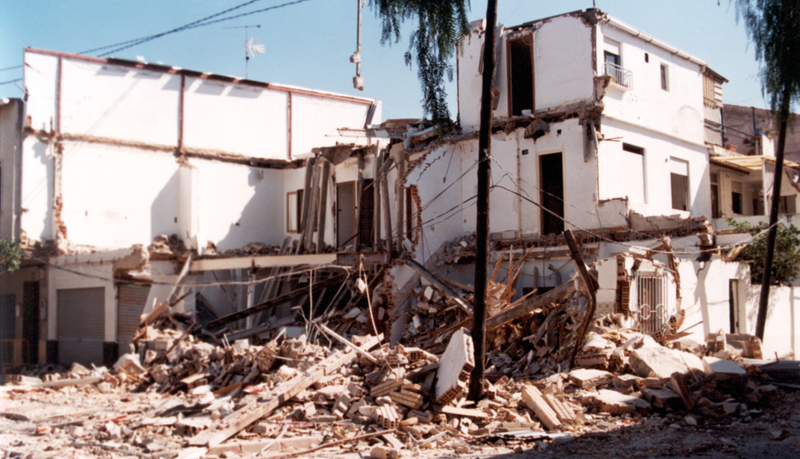 The principal earthquake, with a magnitude of 5.7, occurred on 25 May 1994, and was located approximately 7 km west of the city of Alhucemas (Morocco). It was felt with an intensity of V in Melilla and was also felt in some towns in the provinces of Málaga and Jaén. The duration of this series was approximately four months, with an activity of 230 major events with a magnitude of 2.0, six of these with magnitudes between 4.0 and 4.6 Mw. A later episode, with a larger magnitude, began on 24 February 2004 with an earthquake with a magnitude of 6.2, located approximately 12 km to the south of Alhucemas, where it was perceived with an intensity of VIII, causing damage to numerous buildings and a high number of casualties. 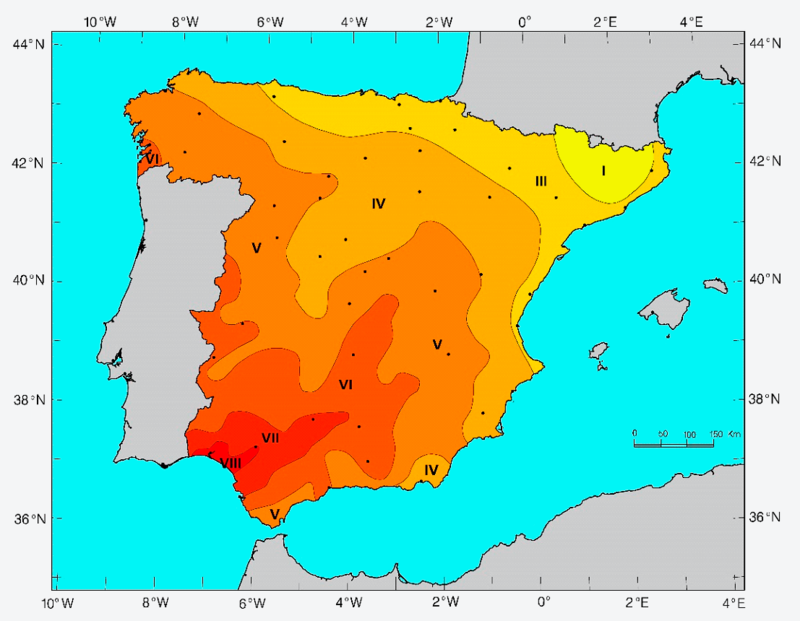 It was felt with a grade of V in Melilla and was also felt in the provinces of Cádiz, Málaga, Granada, Jaén, and Almería. The duration of the series was just more than four months and around 720 earthquakes with a magnitude higher than 2.0 were recorded, five of which exceeded the threshold of 5.0 Mw, with another 88 with a magnitude of 4.0. The current seismic activity in 2016 began on 21 January in the southern part of the Alborán Sea, with an earthquake with a magnitude of 5.1 Mw, followed on the 25th by another with a magnitude of 6.3 Mw, both felt widely in southern Andalusia, Ceuta, and Melilla. In total, close to 2,100 earthquakes have been registered, 7 of these with magnitudes higher than 5.0 (table 1 and figure 6). Figure 6. 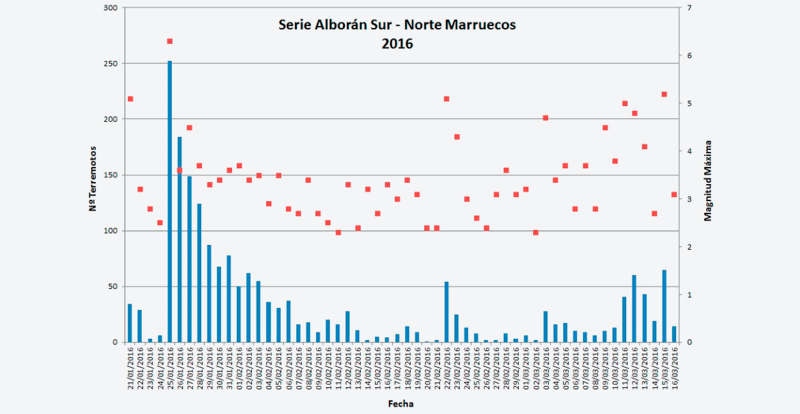 Seismic activity in the Alborán Sea since 21 January 2016. Since the series began on 21 January 2016, more than 30,000 macroseismic questionnaires have been received via the website or the mobile app. The maximum intensity observed in Spain has been VI in the city of Melilla, and this was due to the principal earthquake with a magnitude of 6.3 Mw. The area of perceptibility of this earthquake had a radius of approximately 600 km, with minor damage observed up to a distance of approximately 150 km. The evolution of the series as a function of the number of earthquakes per day and the maximum daily magnitude is shown in figure 7. Figure 8. Distribution of activity from 21/01/2016 to 16/03/2005 with the number of earthquakes recorded and the maximum magnitudes. The equipment for measuring the acceleration of the movement of the ground (10) gave a maximum value of 0.097g in Melilla, which corresponded to the 6.3 Mw earthquake. This acceleration value can be compared for the city of Melilla, although with the corresponding limitations due to its distance from the epicentre, with the basic acceleration value of the NCSE-02 standard that is currently in force, which is 0.08g, or the value of the new seismic hazard map, which doubles this value to 0.16g. If we observe the focal mechanisms obtained for the earthquakes with the 14 largest magnitudes, we can deduce the complexity of the tectonics in the area, with several active faults involved. There are two types that correspond, one to left-lateral tear fault earthquakes (11) and the other to inverse fault mechanisms. These hypotheses must be corroborated by a more precise analysis of the set of earthquakes in the series, once the process has finished. Alberola Roma, A. (1995).- Catástrofe e Historia: el terremoto valenciano de 1748. In: Homenaje a Antonio Bethencourt Massieu. Cabildo Insular de Gran Canaria p. 59-82. Goded Millán, T. (2006).- Reevaluación de daños de los terremotos de Málaga de 1494 y 1680. Dpto. de Geofísica y Meteorología, Univ. Complutense de Madrid. 155 p.
Larramendi, J.A. (1829).- Memoria y relación circunstanciada de los estragos que la terrible catástrofe de los terremotos de 21 de marzo y siguientes, principalmente, el del Sábado Santo 18 de abril hasta el presente día, han causado en Torrevieja y demás pueblos de la gobernación de Orihuela y sus inmediaciones, en la ciudad de Murcia y algunos pueblos de la provincia de este nombre. Madrid, Imprenta Real, 24 p.
López Marinas, J.M. (1977).- Sismo de 9 de noviembre de 1518 en Vera (Almería). Hidroeléctrica Española, Internal report. 8 p.
Martínez Solares, J.M. (2001).- Los efectos en España del terremoto de Lisboa (1 de noviembre de 1755). Instituto Geográfico Nacional, Monografía 19. 756 p.
Martínez Solares, J.M. y Mezcua, J. (2002).- Catálogo sísmico de la península Ibérica (880 a.C. – 1900). Instituto Geográfico Nacional, Monografía 18. 253 p. + 1 mapa. Muñoz, D. y Udías, A. (1980).- Estudio de los parámetros y serie de réplicas del terremoto de Andalucía del 25 de diciembre de 1884, y de la sismicidad de Granada-Málaga. 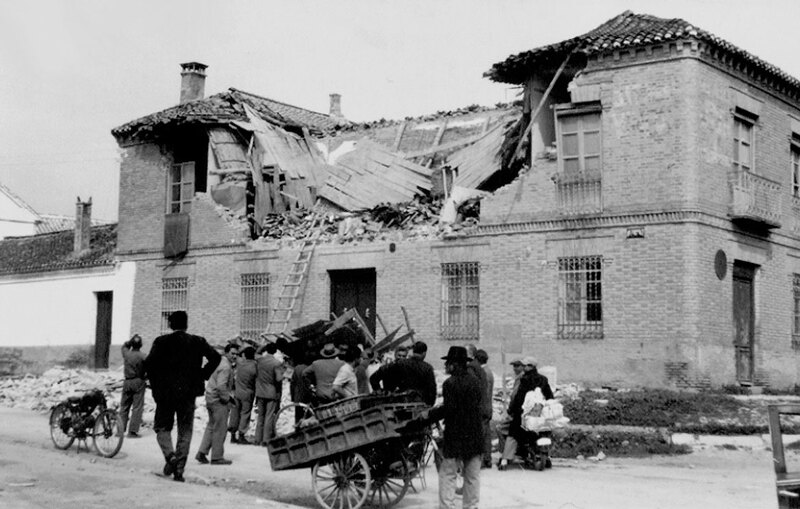 In: El terremoto de Andalucía del 25 de diciembre de 1885, Instituto Geográfico Nacional, 95-139. Sempere, J. (1807).- Reflexiones sobre los terremotos de Granada. Real Academia de la Historia, Ref. 9/5210, p. 416-453. Vidal Sánchez, F. (1986).- Sismotectónica de la región Béticas Mar de Alborán. Tesis Doctoral, Univ. Granada, 457 p.
Villanueva Muñoz E.A. (1986).- La planificación urbana de Vera tras el terremoto de 1518 forma y significado. Roel: Cuadernos de civilización de la cuenca del Almanzora. N. 7/8, p.127-143.